This is the second time I’ve had a conversation with cartoonist Box Brown, and if you want to learn more about how and why he got into comics, you can go read the results of the first one. His new book from publisher First Second, Cannabis: The Illegalization of Weed in America, could easily be pigeonholed as media for stoners, but it’s a lot more interesting and well-informed than that. If you’ve thought about legalization but never considered the complexities of why cannabis use is against the law in the first place, this is the read for you. Brown lays out the race-based fear that fueled the effort not only to make cannabis illegal in the United States, but around the world, with plenty of interesting anecdotes along the way. He answered questions over email about the current state of reversing that illegalization, what made him interested in the topic and how junk science affects the conversation. Paste: Why focus on cannabis for this book? Box Brown: I’ve had a pretty long personal history with cannabis, was arrested as a teenager. I found myself watching the Pennsylvania congress debate the law surrounding medical cannabis a few years back, and it was like watching a bunch of people that had never seen baseball before try to umpire a game. I think people are now viewing legalization very favorably and seeing dollar signs everywhere. There is even money in opposing cannabis legalization coming from lobbying groups. It’s quickly become a totally unwieldy cash grab. But almost no one understands the history behind cannabis. Legalization isn’t just an opportunity, it’s righting an 80-plus-year wrong. It’s a story that’s so absurd I couldn’t write it as fiction. Paste: What’s different about creating a book focused on a more general topic as opposed to a biographical nonfiction project? Brown: Since I build story from characters, I often place the inanimate object in the role of central character. When I was working on Tetris: The Games People Play, I often thought of the game itself as the main character. In Cannabis, I tried to portray cannabis as the main character, and it’s a sad story really. Of course, there is a hopeful ending, not to give too much away. Paste: How do you decide what to draw when you’re laying out what might be seen as pretty dry facts? Brown: It’s something that I think I just feel out. After many years of daily comic-making, a lot of it is pure muscle memory. But to me all of this stuff isn’t dry, and I hope my enthusiasm for these little details plays out for the reader. I got really interested in drawing dirt in this book. This is all the joys of making comics! Paste: What country do you think has the best cannabis laws? Brown: Well, Canada has national federal legalization with homegrow. I cannot overstate the importance of allowing homegrow. It is our only defense from what has become a corporate takeover of an industry. The East Coast of the United States is pretty much under the thumb of a few massive cannabis corporations that have formed on the West Coast. The politicians are ushering in these monopolies and letting them write the laws basically. They always eschew homegrow right away. Cannabis is an easy-to-grow, plentiful natural resource. If they take away homegrow, they make it scarce. Then only these few out-of-state companies control every bit of cannabis in the market. Once the U.S. passes a federal legalization law, these few companies will move to the cheapest place to grow and distribute. Watching this wave of legalization can be disheartening because it’s not happening in the way we all believed it would. I think a lot of people thought it might be like flicking off the light switch. Cannabis is legal, people stop being arrested and we can all grow it and buy it like tomatoes. But what’s happening is very, very messy and ugly. It’s better in some places and just different in other places. We have places like Michigan where they have 10 plants allowed for homegrow and all of the companies producing cannabis for sale are local to Michigan because of their robust licensing system. They’re the gold standard right now aside from Colorado, which is quite an amazing place for a cannabis enthusiast. The worst part of this all is that the United States forced every single country in the United Nations to make cannabis illegal in the early 1950s. India, which has a culture of cannabis use going back to antiquity, was forced to outlaw a religious sacrament. Imagine if India forced the U.S. to outlaw sacramental wine. Paste: What direction do you think we should be moving in as a country? Brown: Wow, that’s a very difficult question. Regarding cannabis? I’d like to see states separate legalization/expungement/release and sales schemes. This is what happened in Vermont and Maine. You have to stop the bleeding. In New Jersey, they are still arresting 89 people a day for cannabis while debating who is going to make the most cash off them when they legalize. It’s disgusting. New Jersey’s legalization law will have no homegrow and I guarantee will have the highest prices in the country because of the way they’re setting up the law. Only a few out-of-state corps will be allowed to allowed to grow. I’ll call out the corporations here too: Moxie, Prime Wellness, Vireo, Cresco. They’re manipulating government officials to benefit themselves. Then they come in and charge double the black-market prices, and they’re doing it mostly to patients only. Paste: What brought this issue to your attention? Brown: As a lifelong cannabis user and enthusiast it’s never been far from my gaze. They didn’t always mention it in the media 100 times a day. It used to be a complete joke. In the 1990s, it was a punchline in a movie comedy while the Clinton administration doubled the amount of people arrested for cannabis in 1996 (the year I was arrested, by the way). Now watching every newcomer in the world talking about cannabis, I was dying to say my piece. Paste: Philadelphia seems like an interesting place for criminal justice reform at the moment. Thoughts on that? Brown: Larry Krasner? He seems to be doing good work. I have to say I’ve felt a lot better about my lifestyle when they decriminalized cannabis possession within the city a few years ago. Smoking a joint in public is just a $25 fine now. Paste: One of the things this book makes you realize (made me realize anyway) is that an anti-science mentality has always been more the norm than the exception. Do you think people are especially susceptible to bad science/fake news when it comes to drugs? Things we put in our bodies? Brown: I think people are susceptible to bad science and fake news in many, many ways, especially drugs and health. Everyone is looking for better health and wants to believe all kinds of bold claims. CBD is very popular right now, and there is a LOT of misinformation out there. This has been going on forever. Even people ostensibly in the cannabis business are extremely uninformed. The only people I really trust are old-school enthusiasts and black-market growers. It sounds silly, but the public is so misinformed even about the terms involved that misinformation gets spewed constantly all the time. I hear it all day every day from politicians and media people. The general public has no idea what to think. Paste: Did you read this Malcolm Gladwell article in the New Yorker that talks about the dangers of marijuana? On a scale of one to 10 with one being zero nonsense and 10 being complete nonsense, where would you rank it? Brown: I kind of avoided it once I started reading critiques of it. Reading through it now I’d say that it includes a lot of cherrypicking of information. I will say that he’s not wrong that there should be real scientific study of cannabis and behavior and that should include government funding. This is something that’s not happening because of the scheduling problem. Paste: How does one counter junk science and fear-mongering? Brown: Well, it’s pretty hard I think. People tend to stay entrenched in their views. I think being up on the newest information and remembering that NO individual bits of fear-mongering or junk science disprove that this is a naturally occurring plant that has a plethora of uses in many industries that has been given a really bad reputation. Paste: What do you think has to happen in order for people to see the effort for cannabis legalization as something more than a bunch of young people who just want to get high? Brown: I think we’re already there in public opinion. It’s funny, you never hear people describe gun rights people as “young people who just want to shoot guns.” Cannabis is not a punchline. It’s a therapeutic, naturally occurring plant, like aloe. What we—America specifically—have done with it is an absolute tragedy. We created the lies. We spread the lies. Then we exported prohibition to the world. The more people understand the absolute misery we’ve spread, the faster things will move. We’re already past the point of no return. Full worldwide legalization is coming. We’re going to see politicians and corporations continue to duel over this for the rest of our lives. All the while some people will be getting rich and some people will be getting screwed, legal or not. People look at big cannabis corporations as heroes now when just five years ago these same people were seen as absolutely abhorrent criminals who deserved life sentences. Talk to any person who’s had their car searched and been harassed when they don’t even consume cannabis! Is it a joke to them? Is that just a bunch of young people wanting to get high? Paste: What was your favorite fact you discovered while doing the research for this book? Brown: My favorite story is that of Dennis Peron. He was a real hero of legalization. He was arrested with four ounces of pot on him. The four ounces were for his partner who was dying of AIDS. The only therapy that made him feel at all alive was cannabis use. After his partner died, Dennis fought for the entire rest of his life for medical cannabis and in 1996, 23 years ago, they passed the first medical cannabis laws in the country. It’s been a stack of dominoes ever since. It’s impossible to overstate the effect of the AIDS movement on the legalization movement. 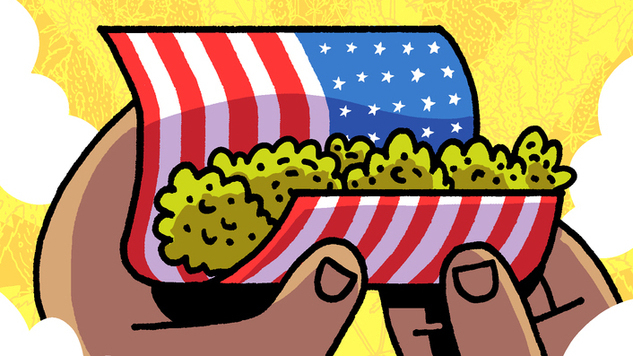 Paste: What’s the single best thing our country can do to fix its past mistakes on cannabis? Brown: STOP ARRESTING PEOPLE NOW. Release prisoners and expunge records. Figure out your sales schemes later. Stop the bleeding. This would be a start.